Recently, writer Adam Clancey was asked by a mate, “Where do you get a marlin smoked in Auckland?” – which inspired this article. 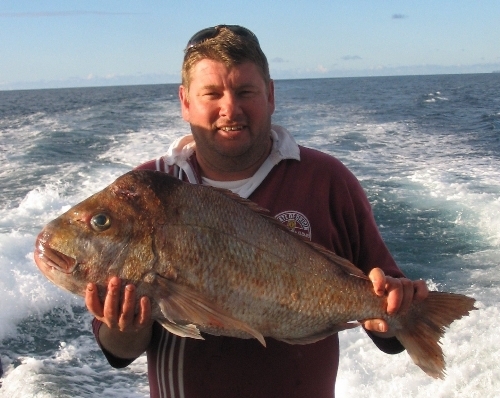 It is not unusual to end up with some very large fish to deal with while fishing, including marlin, hapuku, kingfish or big tuna. It is important to be prepared to deal with this scenario, not only to keep the catch fresh, but also out of respect for the fish you have taken. You may like to release the large fish caught, but sometimes this is simply not practical or possible, and anyway, at the end of the day many of us go fishing to catch a feed of fresh fish. When going on any fishing trip, you need to have some way of keeping your catch cold so it will not spoil in the hot weather, as well as serving to start the flesh-setting process prior to butchering. Having said that, carrying enough saltwater ice to chill a marlin – or other large fish – will obviously be problematic on a small boat. A good way to add some extra cooling elements is by adding a bunch of plastic drink bottles filled with frozen water to the salt ice. Quality chilly bins will keep ice frozen for days. Once you have made the decision to keep a large fish, you should dispatch it as quickly and humanely as possible, as this reduces the stress-induced chemical by-products building up in the flesh. Next, bleed the fish by cutting it across the throat. This is best done over the side of the boat, with the fish securely tethered by the tail, or there will be a big mess to clean up later. Keep an eye out for sharks though, as you don’t want the taxman taking your catch. It’s unlikely you’ll have a chilly-bin capable of holding a fish much larger than a metre or so in length, but an insulated bag can easily be stored until needed. The large catch is then zipped into the bag, with ice and frozen bottles added. If you don’t have an insulated bag, you can slow the spoiling process by covering it with wet towels (keep in mind that the lighter colours reflect heat rather than absorbing it) and/or keeping the catch out of the sun. Butchering the fish onboard is seldom practical. 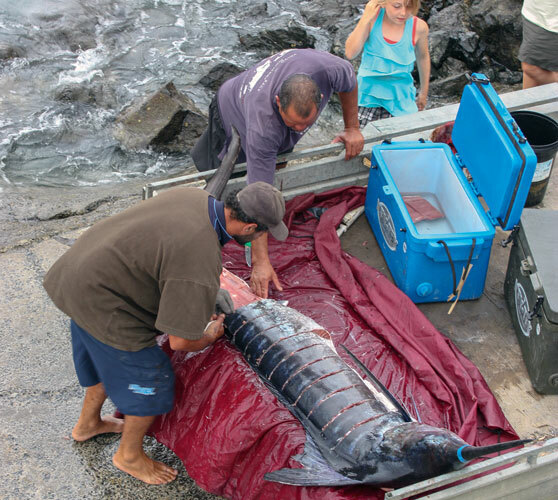 Once back on shore, your catch needs to be processed as quickly as possible. A radio call to many weigh-stations will set the wheels in motion, especially if you want a commercial smoker to smoke your fish. The great thing about this is that they process your whole fish and deal with the remains. If doing the butchering yourself, you will need a good working area, including a great bench, some serious knives and even a hacksaw to process your fish. Also, you will need quite a few large storage containers and a big freezer or chiller. When butchering your catch, make the most of the other sources of good meat. 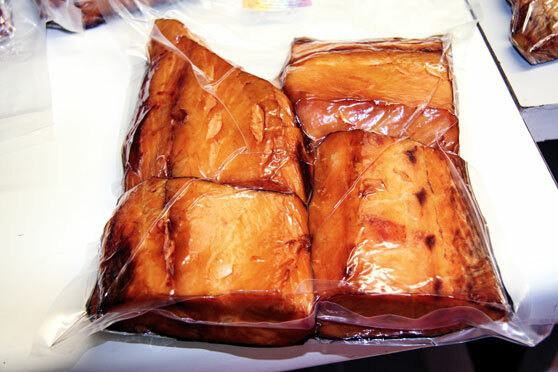 For example, tasty flesh can be found around the heads of large fish such as hapuku – particularly their meaty cheeks, which are a real delicacy and worth the effort of removing. The wings of big fish can be roasted or smoked, too, and are juicy and delicious. Even the backbone can be cooked or smoked and yields some particularly tasty meat. Other parts, such as marlin bills, can be sawn off and dried and mounted – and toothy jaws can be impressively mounted, too. However, some body parts are not suitable for the table, and getting rid of this waste can present some problems. There are a few dos and don’ts. Whatever you do, don’t take the remains to the local boat ramp or beach and dump it. If you can bury it on your property, do so, as it makes great fertiliser for your soil. You could also freeze it and take it out on your next trip, or drop it off at the tip. When it comes to eating large fish, there are many ways to enjoy it and, of course, it can be shared out with family. At least a portion of big fish, such as marlin, will usually end up smoked. While the results can vary widely, according to the smoker and fish species involved, as well as how well it’s been looked after, it’s still pretty tasty. However, as the product’s rather rich and often involves large quantities, you can get over it! Fortunately, smoked fish pate, smoked fish pie and smoked fish salad provide good alternatives to straight smoked fish. But don’t forget to have some of your catch fresh (or newly frozen), too, choosing some of the better cuts and using different recipes. I suggest starting off with a bit of raw fish – especially if you’ve caught a tuna or kingfish – then mixing up the cooking techniques with what’s left. Marlin and broadbill can be eaten like steak and are very tasty. Like many fish, they are best just seared and served relatively rare. Yum.